World Cat In The News The new 23SD Carolina Cat dual console combines sport boat features and catamaran performance. 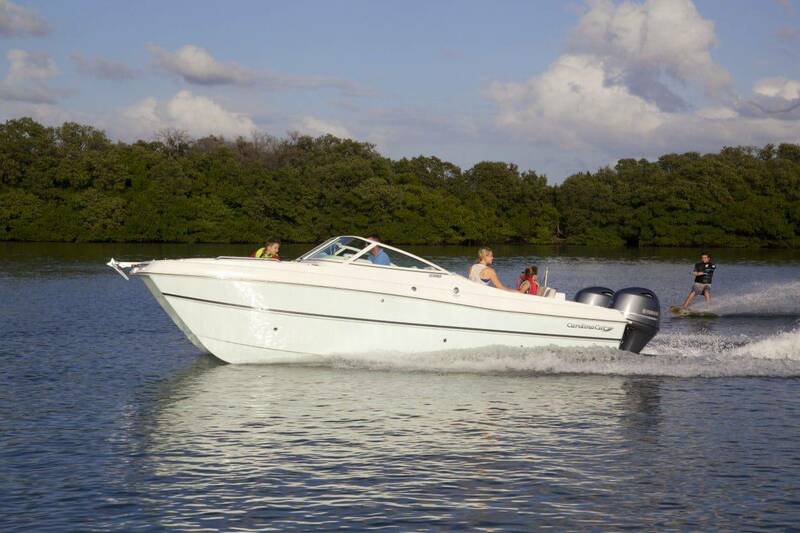 The new 23SD Carolina Cat dual console combines sport boat features and catamaran performance. (Tarboro, NC) Typical bow riders and flat-bottomed deck boats generally stay at the dock until the wind and waves subside. But the 23SD changes all that. Will its proven 23-foot catamaran hull and a deck layout that seats 10 in plush surroundings, you can have fun on the water without worry about the wind and waves. The new 23SD is Carolina Cat’s first entry into the ski, deck, fun boat market and is based on the catamaran hull design that’s made the Carolina Cat 23s one of the best selling offshore 23s in the nation. You’re likely to see Carolina Cat 23s working an edge far offshore. But that big water performance and cat hull design pays off big in an inshore sport boat too. That’s because catamaran hull designs not only cut through the water smoothly and safely, they are more stable at rest because their flotation is on the outer edges. So a catamaran may be the perfect sport boat. The first thing you will note about the 23SD (besides the sporty upholstery in high-grade premium vinyl) is the room! Since a catamaran carries its beam all the way forward, the bow area of the 23SD is huge, seating four adults or tons of kids. And since the cat hulls have their deepest parts on the outsides of the boat, the storage under the console and big walk-in head (with electricflush head standard!) are huge surprises that are concealed below the deck line. you want to disembark forward, there’s another swim ladder for landing softly on the beach or just getting out of the water. under the aft seat. There is even a trash receptacle built into the entertainment center. The new 23SD can be outfitted with the sport package graphics and tower or more simple color options and a bimini. You can pick out premium stereo equipment and even underwater lights to customize your own 23SD. All in all, the Carolina Cat 23SD is an impressive entry into the sport boat market that is not limited to lakes and small bays. In fact, with 96 gallons of fuel and a range of over 250 miles, you could take off for the islands in your Carolina Cat 23SD! That’s not your ordinary sport boat. Carolina Cat builds three models of 23-foot catamarans and is a member of the PowerCat Group. The PowerCat Group builds World Cat, Glacier Bay and Livingston catamarans as well as Carolina Cats in their 140,000 square foot facility in Tarboro, NC. With over 80,000 catamarans built, the PowerCat Group is the world’s largest builder of power catamarans.